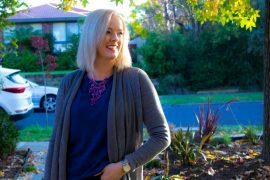 Jill Chivers of Shop Your Wardrobe and I discussed some of our mental processes in putting together outfits each day here. We talked generally about how we think about what to wear and then in a broad way how we made decisions. 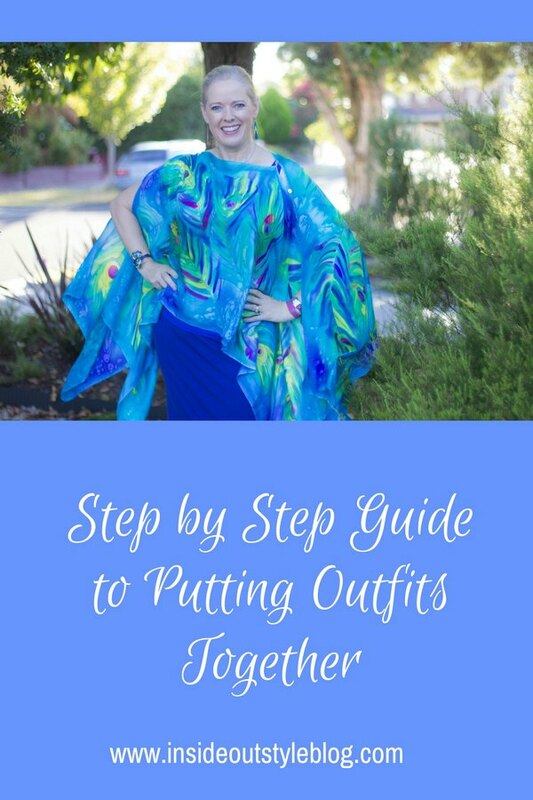 But I know you also want to know, what are the exact steps and thoughts we go through to put together outfits, so we are sharing here examples of this for you to enjoy, take as inspiration, or think “wow I do it so differently”. And of course, there is no one-way of approaching this process. Check my Diary – what am I doing today? Seeing clients or at home in the office? If I have a client, what sort of person? More conservative then work with a more conservative look as I don’t want to scare them, more creative then go a little more ‘out there’. Today is a day at home so I don’t “have” to wear anything in particular. Inspiration Fairy Dust Required – is there any garment or accessory that I really feel like wearing today? How am I feeling mentally? 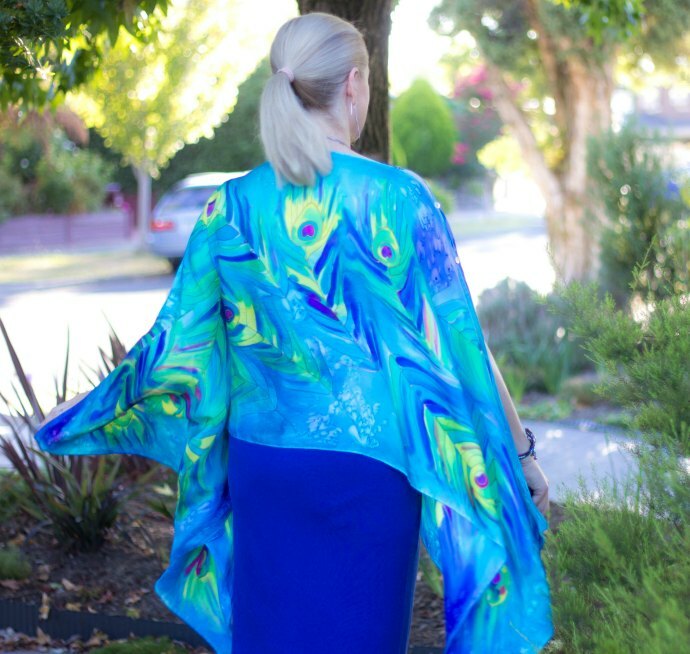 Today I’m feeling like I want something lighter and floaty and I decide that I want to wear my peacock silk poncho, a Christmas present from Silk Art by Liene. That is the first piece in my outfit and decision made. 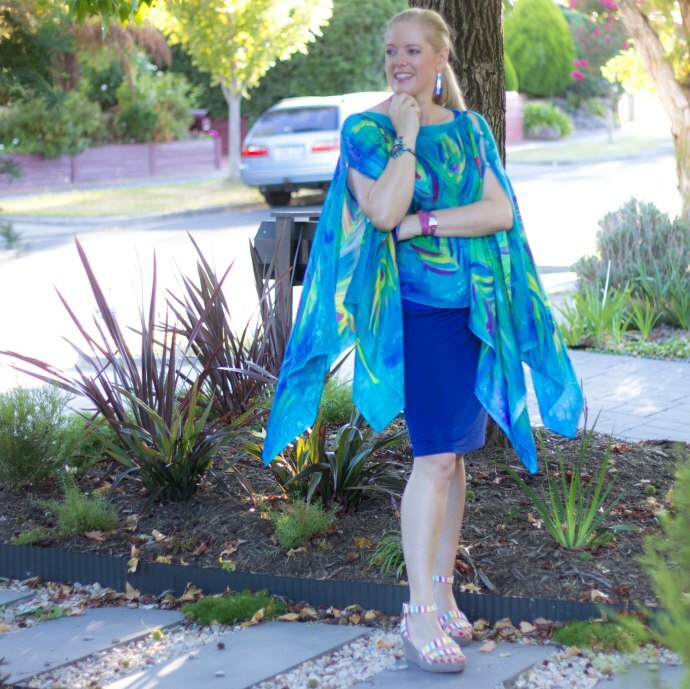 Scan My Closet for Friends – So what in my wardrobe goes with my peacock silk poncho? Who are its friends? What colour will I team it with? It’s got lots of colours in the pattern so I can choose any one of them, though I’d only choose one as more would be too much for me. Knowing that the peacock poncho is voluminous means that I know I need a more fitted base to make it work. Today because it’s hot and I spy my cobalt blue knit straight skirt bought many years ago from Target (so comfy), I decided that I’d wear it with a cobalt blue tank from Motto to create a column of colour and then pop on the peacock print as my hero item. The whole outfit is in an overall medium value (that I can wear) and a low-value contrast, but a high colour contrast. 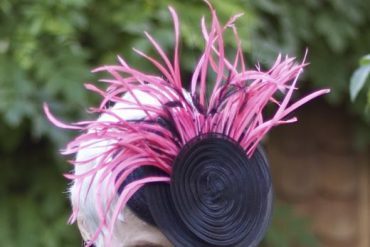 Accessorize – which accessories? I decide as it’s hot that I’ll put my hair in a ponytail and wear feature earrings. I decide that I’ll wear these Meredith Hoult design earrings that are in two shades of blue as the shape reminds me of a birds feather (and a peacock is a bird), relating the colours in the earrings with the theme of the outfit. Then I choose to put on my Betsy Johnson peacock bracelet, it’s flat at the base so easy to wear when I’m typing on the computer and again fits into both the colour scheme of the day and the theme of the outfit. No necklace, as the print is a hero and dominant and I don’t feel it requires anything extra. Watch – I always wear a watch – I may carry a phone around with me, but a watch is something I’ve worn every day since I was eight years old and I feel naked without one. Today I go for my pink wrap bracelet watch. Shoes – I settle on stripy comfy Crocs sandals in colours that are contained in the print. Makeup – Because I’m wearing a multi-coloured print, I choose to add a little extra colour to my eyeshadow – a pink highlighter base, a navy liner with some teal edges on the inner corner of my eyes. Then a pink lipstick to finish. You can see my eye makeup in this tutorial. Final Check – does it feel right? Am I feeling good? Is everything working together? Am I feeling comfortable both mentally and physically? Do I feel attractive and stylish? If I met someone at the post office would they think that I look like an image consultant (should I get asked that question because I’m aware that you are judging me way more harshly than I’d ever judge you)? The answer is yes – so all good to go and get on with my day. 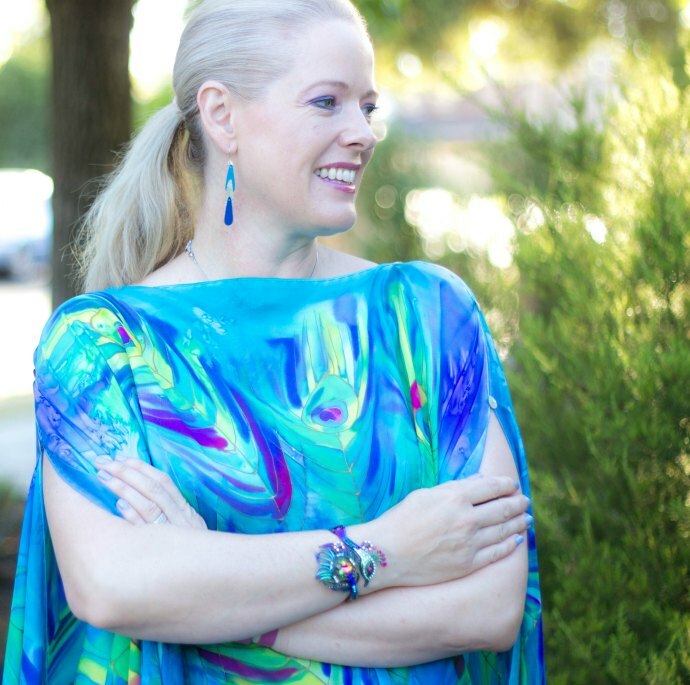 Jill Chivers is sharing two of her ensembles here – the thought processes that she goes through and the way she thinks about composing each outfit so that you can get a little glimpse inside her head. 1. Starting Point – I chose one piece as the starting point for composing this outfit – the duster; which is actually a dress my husband gave me for my birthday eons ago. I just love this piece, the fabric drapes beautifully, it feels lovely on, and I like the way it looks. And of course, my signature leopard print. It’s a softer version of my sometimes bolder or more vibrant animal prints, but I like that about it too, sometimes animal print is best when it doesn’t leap off the body and grab passers-by by the throat, as it were. 2. Desire to Wear My Yellow Boots – Quickly following the duster decision was the desire to wear those yellow suede high heel boots – a recent pre-loved purchase, and one I need to choose carefully when I’ll wear, as they are very high and not great for a day when I’m walking or on my feet for hours. So this was a good day to wear them, was going here and there, running errands, in and out of the car, but not on my feet for any length of time. 3. Adding the Supporting Acts – The rest of this outfit was then pretty easy, it kind of clicked over as pieces to add to make it all come together, very easily. The corduroy jeans blend beautifully with the duster, both in a kind of soft greyed down taupe (these were a hand-me-down from my step-daughter, still going after more than a decade!). 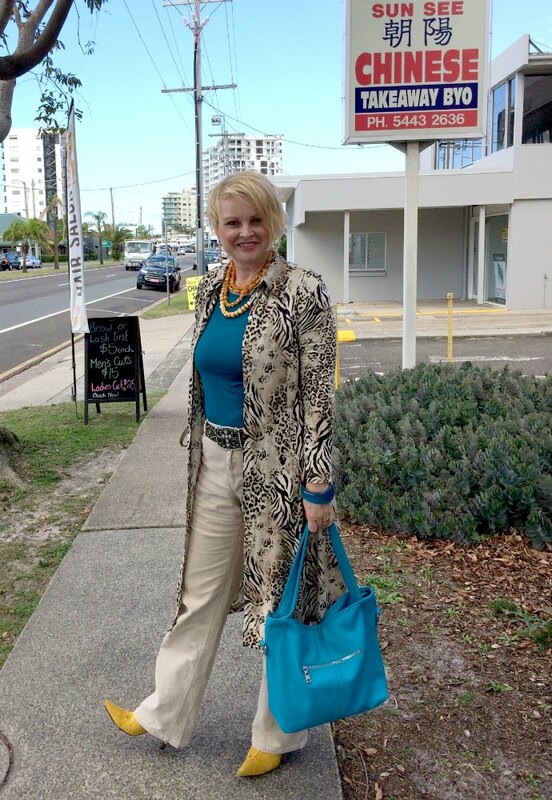 Combining yellow with teal/turquoise is one of my favourite colour combo’s, so the slinky long-sleeve t-shirt and handbag were easy to add (both pre-loved finds and have been in my wardrobe for some time, supporting acts for me). And the yellow beads (one of my creations) tied in with the boots. 4. The Finishing Touches – Finally the belt and chunky bangle, some earrings (always earrings – I can feel naked without earrings). I never wear a watch – none of my accessories forms any real function at all! And along with my wedding ring, probably a costume/statement ring. Hair, make-up – these are the functional parts that finish my outfit which don’t especially interest me but I attend to them because they’re part of completing the day’s getting ready process and are necessary. 5. Remembering the Providence – Outfits like this make my heart sing. They’re a combination of pieces that I feel great wearing, I remember the providence of each item and part of wearing them connects me to how they came to be in my curated wardrobe right now. I enjoy wearing items someone else has loved, combined with new pieces + things I have made myself. The entire outfit feels like a small piece of art, it’s a creation, and a testament to living and loving life. 1. 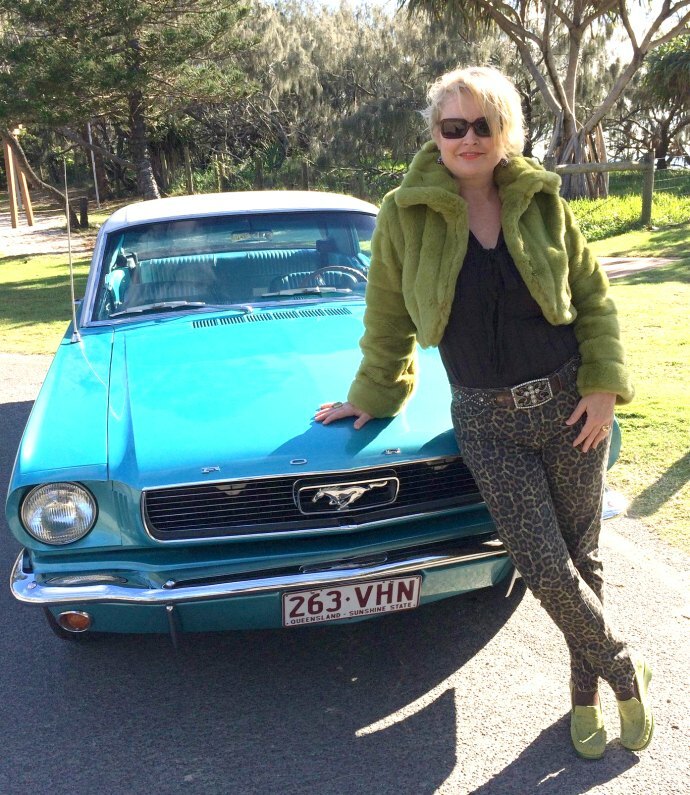 The Starting Piece – I started with one piece as my starting point – the peridot fur bolero jacket. Oh my giddy aunt, do I love that piece of clothing! An Etsy find, I purchased the last one in the US summer (our winter here in Oz) so felt good at buying someone so perfect for me at a great price. I am going through an extended faux fur phase right now. Well, not right now as it’s summer here in Oz, but in winter, I live in them. Even Sundays when I’m lazing around at home, I will wear one of my faux furs, just because I love being in them. So, back to this outfit. The peridot faux fur feels like heaven, it is this extraordinary combination of a very comfortable item that feels utterly glamourous to me. I don’t think of myself as glamorous, but I feel glam in this piece, like a 1940s movie star. 2.Adding My Signature – So big decision made on my hero piece, from there, it’s about filling out the pieces to support this one sensational piece. Leopard print, leopard print – what will I choose? I go with the leopard print jeans (a preloved find), because, well, I always wearing leopard print so it was either a leopard print top or pants. 3. The Supporting Acts – So, pant decision made, it’s deciding on the top. For this ensemble, I chose a plain/solid top, as I didn’t want to add a second colour into the mix competing with the peridot as the star of the show. So I went with a dark chocolate bamboo long-sleeve top (another pre-loved find), which layers all that gorgeous tactility – lovely-feeling top under a lovely-feeling faux fur. It all feels so lovely! 4. Accessory Choices – Belt for impact, then the peridot wedge mocassins (a preloved find I upstyled by painting the heels an emerald green then splatter-painting the suede upper). Went easy on the accessories – wedding ring, earrings and a costume/statement ring. Hair, make-up, done. 5. Being Me – This outfit makes me feel fabulous. I feel I could be both anybody I wanted to be and so deeply and utterly myself in this outfit. It’s a strange combination of feeling my absolute best, without constraint – many things are possible, the best me is possible… and feeling like anything could happen, any me could emerge. Can clothing really affect us this deeply? I don’t consider that every single day, I have to use my precious energy and time for many things and pondering clothing choices this deeply is very energy and time-consuming. But when I do ponder it, I believe the answer is yes. Clothing really can affect us deeply. Mine affect me. What goes through your head when you’re putting your outfit together each day? What are your thought processes? Where do you start? What do you add? Both Jill and I are keenly aware of what suits our unique bodies, and colouring and have a great understanding of our personal styles which is why it may seem easier for us than for some of you. This is why I believe knowledge is power in the style game. The more you know, the easier it becomes, the more you understand what is you (versus not you – those pieces that you buy that remain unworn in your wardrobe and you’re not sure why). Learning about all the elements of the style puzzle has helped me make much better decisions and saved me a fortune as I only buy pieces now that I know I’ll love for a long time, fit into my existing wardrobe so will mix and match and be versatile additions, and that are flattering. 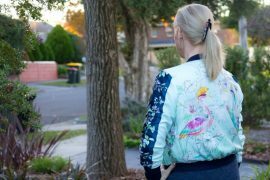 Pieces that are representative of my personal style statement – my style recipe that rate at least an 8 or more. What may seem easy to us (to you) has come with time, learning, trial and error and exploration and is the reason I created my 7 Steps to Style program, so that I could share with all of you my vast knowledge in smaller pieces that you can apply to your own style and wardrobe choices. Previous articleIs There a Process for Putting Stylish Outfits Together? I love this post Imogen. It’s great to read through what might appear to be a mysterious, complex, subconscious process, described in such a simple and logical way. You and Jill both make the process sound straightforward and doable. Inspiring! Would you and Jill consider doing more posts on this theme? I believe we will if you all think it’s something you’d like more of! I’ve especially enjoyed this post. I love the little details about comfort & feeling right physically. I find clothing can have a very uplifting effect too. I relate to Jill’s description of feeling totally herself & also full of potential. 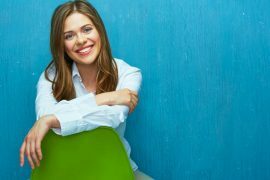 Imogen I have often thought the biggest drawback to being an image constsultant must be being judged all the time – especially as you’re brave enough to be open on the internet. Thanks you both for communicating all this so well. Oh yes – the thing I didn’t realise was that I would be the one being judged, not doing the judging. Serious pressure when you just need to nick down to the supermarket! I love your outfits, how you choose and put them together is amazing. Both Imogen and Jill look fantastic in what they wear. You are an inspiration to me, though I try to dress so I look taller and thinner, trying to camouflage wide hips, low bust. Your ideas have helped me in my choices of clothing. Thanks so much Margaret! Glad that we can help you in any small way. It’s funny all of the aspects that we consider when putting together an outfit. But really, that’s what makes them successful, I think!!! Thanks Jodie! It was fun to write! Just take baby steps! A little bit at a time adds up to a lot over time! What a great post! I love seeing your contrasting methods. Very helpful.